TurboLap delivers high-speed reciprocation with high torque and a short stroke. Ideal for filing, lapping and polishing molds or honing precision parts. Makes quick work of polishing ribs, slots and intricate areas. Runs quietly and is designed to be operated for long periods without getting hot. Provides optimum results with Diamond Poli Files and 1mm flat Super Ceramic Stones (see "Related Products" below). Lightweight with good balance and ergonomic soft-grip design. 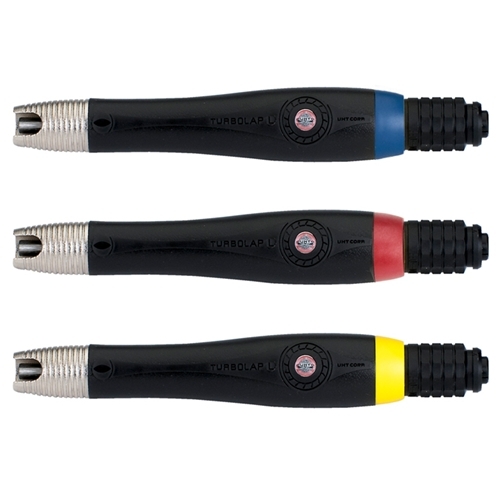 Three color-coded models, each supplied with hexagonal wrench, 1 Diamond Poli File, 1.5m air hose, overhose, hose bands and quick joint with filter. Accepts up to 1mm flat or 3mm round tools. Requires 1/4” NPT air connection and Filter/Regulator. No oil lubrication required. Measures 7" long x 1" diameter. Weighs 5.9 ounces.